Work in the garden takes priority over interacting with my symptoms...It’s a kind of medicine, to be outside caring for plants, harvesting, weeding and seeding in the greenhouse. A FoodShare Toronto and CAMH partnership, the Sunshine Garden is a plot of tranquility and reprieve in the middle of the city. The Sunshine Garden, Canada’s first ever market garden on hospital grounds, operates as a recreational gardening program for clients. Each year, over 30 CAMH in-patients and out-patients enjoy the therapeutic returns of nurturing the garden, while getting to know their neighbours and breathing in fresh air. During the spring and summer, clients grow great things in the garden. They compost waste, cook, preserve and sell the harvest at the Garden Market. During the winter and fall, clients work in the greenhouse, raise seedlings and learn via workshops. Sometimes land can be more than a garden, it can be a medicine and a salve. When neighbours visit the the Sunshine Market Garden, when they buy patty-pan squash and when they speak with the gardeners that nurture the land, mental illness is destigmatized. Perceptions are changed and good health is cultivated. Go past the first intersection, and then you will see a pedestrian path on your left hand side. The pedestrian path will lead you right to the garden. 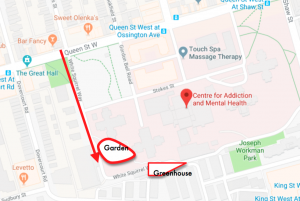 To get to the Greenhouse, go all the way to the end of White Squirrel Way, turn Left, and you’ll see the greenhouse on your Right hand side, just past a large historic brick storage building. Liz Kirk and a group of volunteers talk about the hidden gem at CAMH: The Sunshine Garden. Hear about the therapeutic returns of gardening and how the garden is a piece of everyone who works on it. People don't just learn about where their food comes from, they learn about horticulture in a serene environment. You can sit in the healing environment, taste the produce or even help run markets. You won't want to leave. 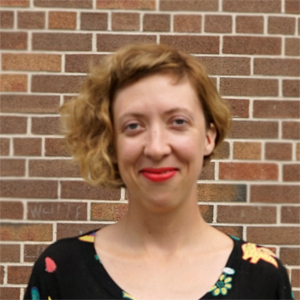 Contact Natalie Boustead if you have any question about this program. Do you want delicious, just picked organic produce grown with care at the Sunshine Garden? Drop by the Sunshine Garden Market on Wednesdays from 11:30am to 1:30pm in the summer months at the corner of Queen St W and Gordon Bell Road. All proceeds support the Sunshine Garden.